There's always room for one more fun, bright, cool, crazy throw pillow - especially when it's as fun as this bold and bright treat of a pillow! 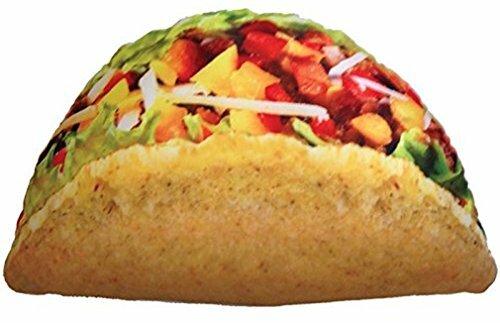 This full-color, photo-real print pillow is shaped just like a crunchy taco that's ready to liven up any space. And it isn't just fun to look at - this softy is filled with microbeads that move with you making it super comfortable and squishy! Sizable pillow measures 20" high x 12" wide x 4" deep. The perfect combination of colorful fun, to-die-for design, quintessential quality and cozy comfort - just what you expect from iscream! At iscream we are obsessed with fun, function and style - see our whole line for new ideas and old favorites with a new twist! Best of all, this pillow isn't just fun to look at - this softy is filled with microbeads that move with you making it super comfortable and squishy! The perfect combination of colorful fun, to-die-for design, quintessential quality and cozy comfort - just what you expect from iscream! Manufacturer: The Mines Press, Inc. Publisher: The Mines Press, Inc. Studio: The Mines Press, Inc.
View More In Kids' Home Store. If you have any questions about this product by iscream, contact us by completing and submitting the form below. If you are looking for a specif part number, please include it with your message. RABBITGOO 3D Cross Pattern Frosted No Glue Static Cling Privacy Glass Window Films, 35.4" x 78.7"